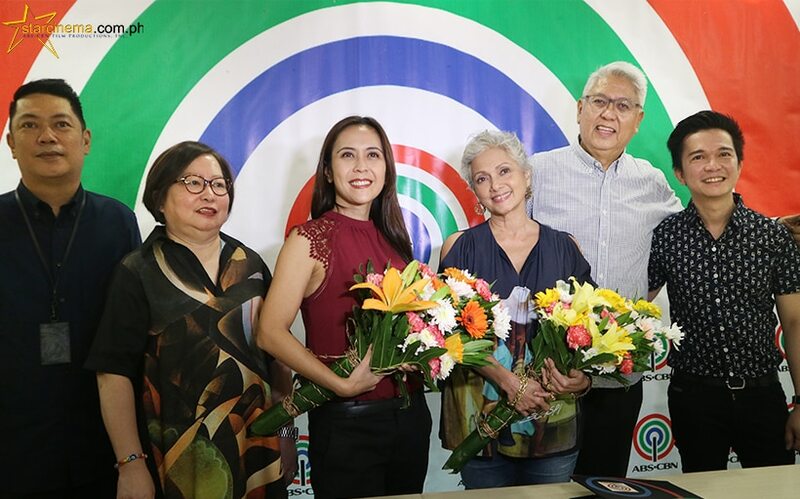 "This is our musical, musical ng ating bayan"
Maestro Ryan Cayabyab, Rachel Alejandro, Celeste Legaspi, and talent manager/producer Girlie Rodis from "Ang Larawan" joined Star Music executives today, August 29, for the movie's OST contract signing. "Ang Larawan" is dubbed as the country's most culturally important film to be shown in cinemas in the last quarter of the year. Its OST album will also have a special vinyl edition release. The 2017 film adaptation is based on "Larawan," Nick Joaquin's original three-act English play that was first published in 1952. In 1997, it was adapted into a stage play, headed by Celeste and Girlie. It was transformed into a musical with the help of Mr. C's compositions. After a long brewing period, the movie is finally pushing through, hopefully in December, according to Celeste. She said, "'Yung pag-prepare namin for this actually took four years. So how to describe how we feel now? Sobrang nag-uumapaw na kaligayahan is one way to describe it. Also, disbelief is another. Pero, also we're very thankful. Nagpapasalamat kami." Rachel, who plays Paula in the movie, is also excited and is looking forward to the early release of the album's first single. "I'm so excited kasi itong lalabas ngayon, actually September 8 na maire-release 'yung very first single from the soundtrack album of 'Ang Larawan,' which is a duet between me and Ebe Dancel. Sinulat niya 'yung song inspired by the movie. So, lalabas na rin 'yung music video. It's been seven years since my last recording, so natutuwa talaga ako, parang, 'Wow, I'm back,'" Rachel said. Aside from Ebe's pop commercial composition, Yeng Constantino's rendition of "Kay Sarap ng Buhay nu'ng Araw," is also included in the OST album. Rachel said that everyone can relate to the story, saying, "What I love about it is that it is actually timeless at makaka-relate ang lahat ng Pilipino because at the end of the day, tungkol siya sa pagmamahal ng dalawang magkapatid. It's really about the love of family, the love of two sisters, and dahil nga it's also a musical, the Pinoy's love for music, nag-tie in lahat. For me, 'yun ang relevance nito, and that's how everyone, young and old will be able to relate." "Napakatagal na naming nag-prepare for this. And we're so sure, we're so excited dahil magugustuhan ng lahat. Because this is our musical, musical ng ating bayan," Rachel said. The "Ang Larawan" soundtrack will have all-original music composed by Mr. C, all of which are played by the ABS-CBN Philharmonic Orchestra. "Syempre alam natin na with that kind of recording, iba na 'yung tunog. Bigla siyang lumawak, 'yung tunog. Kahit pagka narinig niyo 'yung tunog ng pelikula, ako din nagulat eh kasi 'yung first time ko napanood, 'Wow, ang ganda ng tunog," Mr. C shared.